Flash or continuous lighting—why not both? How to combine two kinds of light sources for unique results. Continuous light is something that is seen by many photographers as inferior to flash, for good reasons. It is under-powered, less flexible and less portable. However, it yields also some great benefits. With continuous lighting, what you see is what you get, which makes it easier to set up your lights for the desired effect. In this article we will not try to show one—flash or continuous—is better than the other, but rather that the two can work together in harmony. Why should combining strobe and continuous light be worth the bother? Our initial impression would say that both light sources yield the same type of light when used with similar modifiers, but in practice it is possible to create something really special by embracing the difference between the two. Flash freezes action, while continuous light allows for motion. I think everyone is aware of this difference and has already seen what it can do. For example, when taking a picture from a moving car with flash in a dark environment, you freeze the car with the flash and the continuous light from the headlights/taillights create the movement in the photos. Continuous light can come from commonly found light sources, such streetlights or car light but they yield little control. Things get interesting when you can control the continuous light sources similar to how you would control a strobe. To do so you need a dark environment where the existing ambient light doesn’t influence the outcome of your final result significantly. For the examples that are shown underneath I used a studio that where nearly all ambient light could either be switched off or blocked. As you might have already understood from the photos that are used as example you need multiple light sources for this type of photography. For this specific shoot I have used a Godox QT600II with a gridded beauty dish as main light to freeze the front side of the subject and two continous lights as rims, one Godox SL60B with softbox and a multicolour LED light. The shutter speed should be long enough in order to allow motion blur. Depending on the power of the continuous light the best duration may differ, but for my results I have used a shutter speed of half a second and during the exposure I moved the camera in order to force motion blur. 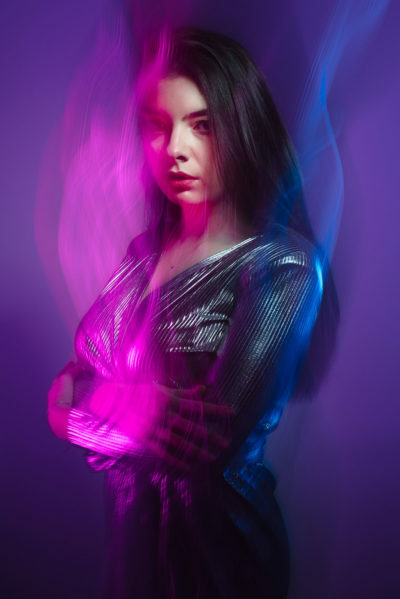 With the right setup and parameters the result is that the face is sharp, due to the quick pulse of light from the strobe which freezes motion while the continuous light allows motion blur. It is a fairly easy trick in order to get a more artistic effect in camera without having to resort to photoshop. Although it is easy to get started, getting exactly the desired effect can be difficult. Material of the clothing, the movement of the camera and the colour of the continous light play a big role in how exactly your photos turns out. For an experiment I am quite pleased with the outcome of my photos. It shows you that with a bit of creativity you use your current equipment in different ways. I am also curious to hear your experiences with mixing strobe and continous light. Have you already done it before? Or is it something that you are planning to do? Let us know in the comments!